Today I am on the blog tour for I Give You My Heart by SarahJane Ford. I share my 5 star review with this one! This one reached me on a personal level. A terminal diagnosis. A life-saving sacrifice. A love letter written on the walls of her heart. Alice Richards looked forward to watching the seeds of love she and her husband planted bloom and grow well into their old age. But her plans for the future shrivel up and die when she learns she has an inoperable brain tumour. Determined that she won’t die in vain, she decides to become an organ donor. With a few precious months left, Alice begins documenting her fairytale romance—from their first meeting to the children they dreamed of having. She’ll pass on every detail to her heart’s next owner… along with careful instructions to send her husband reminders of her undying love. Before her time runs out, Alice must find the perfect candidate to guide her husband through unimaginable grief and hold the memory of their love in her heart. I Give You My Heart is an emotional romantic fiction novel with an uplifting message. If you like strong-willed women, undying love stories, and honest portrayals of coping with a terminal illness, then you’ll love SarahJane Ford’s heart-warming epic. An unmissable love story full of warmth, beauty and with a huge, beating heart. Perfect for fans of Cecilia Ahern’s ‘P.S. I Love You’ and Jojo Moyes’ ‘Me Before You’. I Give You My Heart is a very touching read. Alice is just 26 years old and she finds out she has an inoperable brain tumor with very little time left. She decides against treatment and wants to be an organ donor. BUT she doesn’t want her heart to go to a random person. She wants the person selected because her heart is precious to her. Her heart belongs to her husband Alex, and she wants her best friend Ryan to find the perfect recipient for her heart. She feels her heart will always love Alex and whoever receives it will be a part of Alex’s life. Given the importance of her heart, Alice writes a manual to the person who will soon receive it. The chapters alternate between Alice’s life and the manual she is writing to the recipient. In the manual she also shares about her life with Alex and gives directions she hopes the recipient will one day follow. Do not let the summary keep you from reading this novel. Yes this is a sad subject, but handled in a positive way. I am very emotional and thought I would cry as I read it, but I did not; though I did come close at the end of the novel. It is uplifting as Alice writes her manual and lives with the decisions she has made. I Give You My Heart will make you think about the end of your life. Do you have plans to be an organ donor? If you have not thought about that, once you read this novel, you will want to become one. 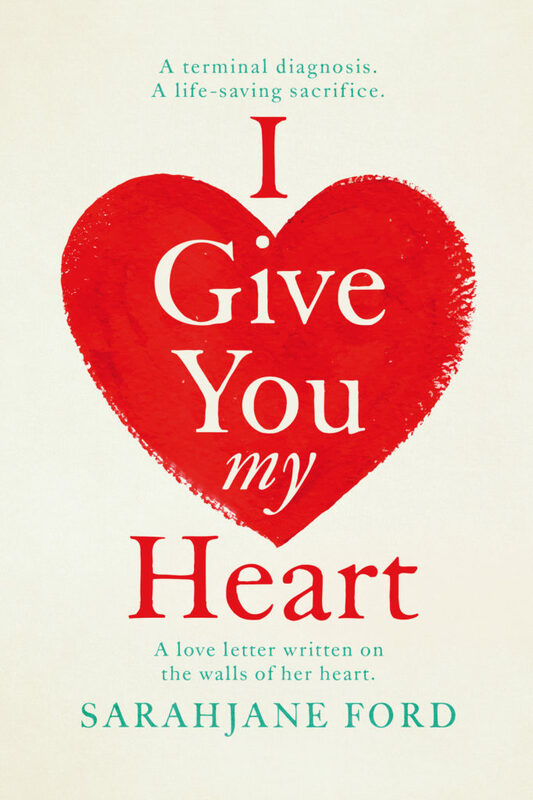 SarahJane is the debut author of ‘I Give You My Heart’ which is due to be published on September 1st 2018. SarahJane was born in Scotland but grew up in the Cheshire countryside, which is home to her. After a few years living in Oxfordshire and Buckinghamshire, where she went to secondary school, she has now settled back in Cheshire in a quirky flat surrounded by trees, birds and rolling fields. A marketing professional since finishing her formal education SarahJane is delighted to be following her writing dream. She still works part-time as a Marketing Manager, whilst furiously penning her second novel. Harbouring an adventurous spirit, SarahJane loves to travel, be surrounded by the wilderness or be riding Cornish waves. SarahJane loves to read (ideally by the sea!). She was raised on the greatest love stories, which is where her romantic soul comes from. She is in love with love…Mr Darcy’s brooding looks in Pride and Prejudice; Julia Roberts and Richard Gere’s arresting chemistry in Runaway Bride; the intensely emotional Titanic; going weak at the knees for Danny Zuko in Grease; Cecilia Ahern’s heartbreaking P.S. I Love You and Patrick Swayze’s mega moves in Dirty Dancing.